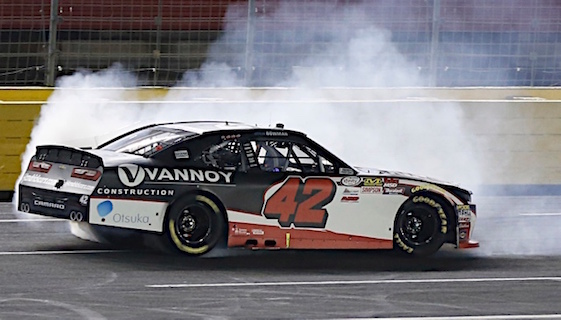 Alex Bowman drove to victory in Saturday night’s rain-delayed Xfinity Series race at Charlotte Motor Speedway. Bowman’s victory was his first in the the series. Ryan Reed finished in 12th place, one position behind Brendan Gaughan. But Reed moved on to the Playoff’s Round of 8 by one point over Gaughan, who was eliminated along with Jeremy Clements (20th on Saturday), Blake Koch (25th) and Michael Annett (27th). Reed joins Justin Allgaier, Elliott Sadler, Brennan Poole, Cole Custer, Daniel Hemric, William Byron and Matt Tifft in the Round of 8, with the series set to resume competition Oct. 21 at Kansas Speedway. Bowman drove to victory in the No. 42 Chip Ganassi Racing Chevrolet, under an agreement with Hendrick Motorsports. Since his last races at Homestead, Bowman has spent the bulk of his time driving simulators for HMS. “I can’t thank Mr. (Rick) Hendrick and Chip Ganassi enough for letting me drive this car,” said Bowman, who will succeed Dale Earnhardt Jr. in the No. 88 Chevy in the Monster Energy NASCAR Cup Series next year. “To get my first win here at my second home in Charlotte means so such. (4) Alex Bowman(i), Chevrolet, 200. (31) Sam Hornish Jr., Ford, 200. (2) Ryan Blaney(i), Ford, 200. (12) Austin Dillon(i), Chevrolet, 200. (9) Brennan Poole (P), Chevrolet, 200. (13) Cole Custer # (P), Ford, 200. (8) Daniel Hemric # (P), Chevrolet, 200. (1) Daniel Suarez(i), Toyota, 200. (14) Matt Tifft # (P), Toyota, 200. (7) Elliott Sadler (P), Chevrolet, 200. (16) Brendan Gaughan (P), Chevrolet, 200. (11) Ryan Reed (P), Ford, 200. (22) Brandon Jones, Chevrolet, 200. (20) Ross Chastain, Chevrolet, 200. (10) Ty Dillon(i), Chevrolet, 200. (6) William Byron # (P), Chevrolet, 200. (18) Corey LaJoie(i), Toyota, 200. (21) Ryan Sieg, Chevrolet, 200. (19) JJ Yeley, Toyota, 200. (23) Jeremy Clements (P), Chevrolet, 199. (25) Ray Black II, Chevrolet, 199. (30) Harrison Rhodes, Chevrolet, 199. (27) Garrett Smithley, Chevrolet, 199. (33) Mario Gosselin, Chevrolet, 199. (15) Blake Koch (P), Chevrolet, 199. (29) David Starr, Chevrolet, 198. (17) Michael Annett (P), Chevrolet, 197. (28) BJ McLeod, Chevrolet, 196. (34) Chad Finchum, Toyota, 193. (3) Erik Jones(i), Toyota, 192. (26) Joey Gase, Chevrolet, Oil Leak, 161. (36) Mike Harmon, Dodge, Suspension, 160. (5) Justin Allgaier (P), Chevrolet, Overheating, 112. (24) Spencer Gallagher #, Chevrolet, Accident, 62. (37) Timmy Hill, Dodge, Steering, 52. (35) Angela Ruch, Chevrolet, Accident, 36. (40) Reed Sorenson(i), Chevrolet, Electrical, 15. (39) Morgan Shepherd, Chevrolet, Handling, 13. (38) Gray Gaulding(i), Chevrolet, Electrical, 3. (32) Jeff Green, Chevrolet, Steering, 2. Average Speed of Race Winner: 122.685 mph. Time of Race: 02 Hrs, 26 Mins, 43 Secs. Margin of Victory: 1.390 Seconds. Lap Leaders: D. Suarez(i) 1-40; E. Jones(i) 41-47; T. Dillon(i) 48-51; D. Suarez(i) 52-93; H. Rhodes 94; D. Suarez(i) 95-123; R. Blaney(i) 124-161; W. Byron # (P) 162-165; E. Sadler (P) 166; W. Byron # (P) 167-168; A. Bowman(i) 169-200. Leaders Summary (Driver, Times Lead, Laps Led): D. Suarez(i) 3 times for 111 laps; R. Blaney(i) 1 time for 38 laps; A. Bowman(i) 1 time for 32 laps; E. Jones(i) 1 time for 7 laps; W. Byron # (P) 2 times for 6 laps; T. Dillon(i) 1 time for 4 laps; H. Rhodes 1 time for 1 lap; E. Sadler (P) 1 time for 1 lap.